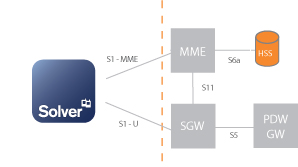 Solver LTE, a high-performance test tool for load and functional tests of the EPC (Evolved Packet Core) in LTE networks. Solver LTE simulates an E-UTRAN with a large number of user equipment devices connected, providing load and stress to the Evolved Packet Core (EPC) network. Solver can test the control plane and the user plane with various applications and patterns. Sessions can be configured and used alone, for testing of specific scenarios, or in parallel to simulate a normal usage of the network and analyse the behaviour of the EPC. Sessions in Solver are created in minutes thanks to the easy-to-use GUI. The sessions can then be started using same GUI, or by scripts for automated tests. The results are generated and saved in a format that can be retrieved and used in other systems.